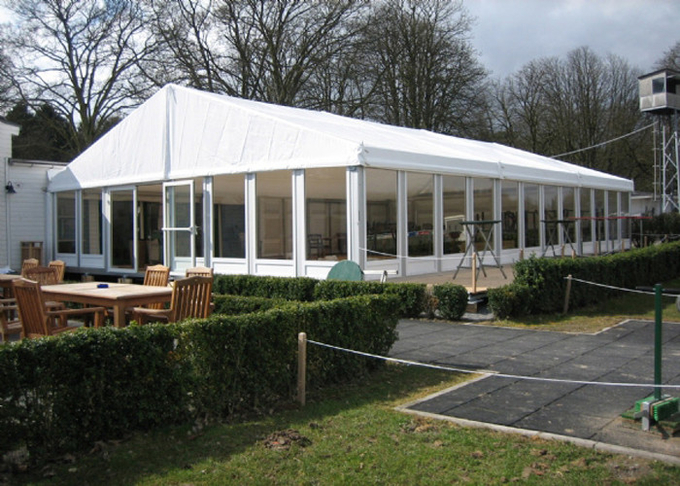 Wedding, Party, Exhibition, Church, Event, Etc. 15m,20m,30m,40m...Customized size or shape is available. ♦ Frame stress: hard pressed extruded aluminum 6006/T6(15HW) which can last more than 10 years. ♦ Fabric cover: high quality double PVC-coated polyester textile, 100% waterproof, flame retardant to DIN4102 B1, M2, CFM, UV resistant, tear resistant, self-cleaning ability, color can be chosen from white, transparent, red, etc. 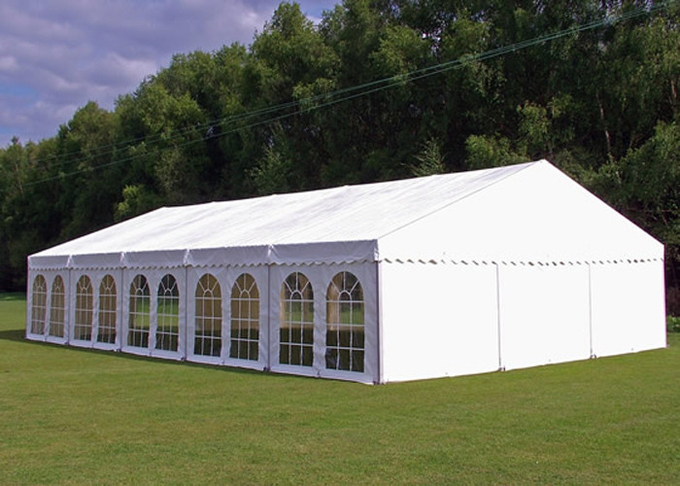 ♦ The roof and sidewall fabric cover are made of double coated PVC. ♦ The fabric is waterproof and UV resistant. ♦ The fabric is flame retardant to DIN4102, M2 and Grade B1. ♦ The weight of fabric is from 650g/sqm to 850g/sqm. ♦ Expansion screws: for concrete floor like cement. ♦ Steel nails: for soft land and grass land. ♦ Weight plate: for floors can't be damaged. 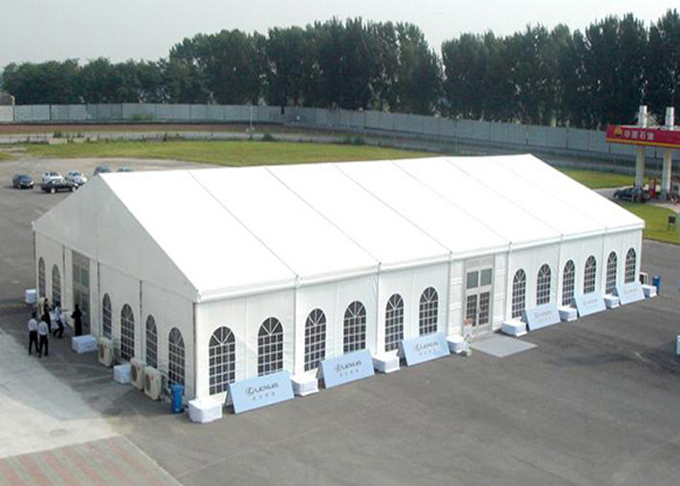 The large aluminum frame pvc cover wedding marquee party tent can be used for birthday party, festival ceremonies, outdoor event and so on. 1. 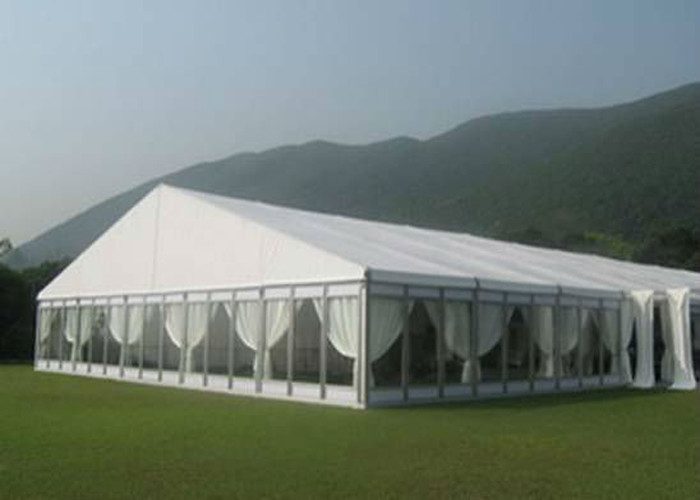 Custom design the tent according to the clients' requirements ,for example, higher height and unique shape . 2. We will do trial installation when we finish the production ,Installation video or pictures can be taken and must be sent to the client to check the quality and make payment of balance before delivery. 3. Installation manual /drawings can be provided for free if required. 5. Accessories can be provided at more favorable prices . 6. Frame can be working well for 10-15 years while fabrics for 6-8 years.